Ah, approved figs. One of my favorite odd foods. They look so weird, store but taste so good. I love them on pizza with prosciutto, angina in a salad with fennel and especially with cheese. Almost any kind of cheese. 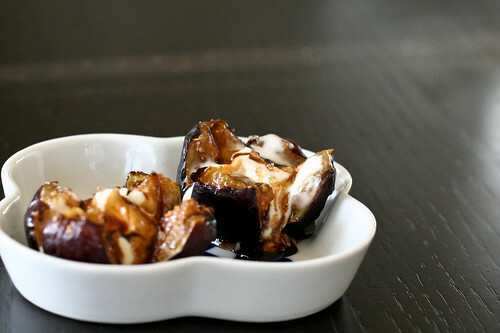 One of the best appetizers you’ll ever make is a mission fig stuffed with blue cheese and drizzled with honey. So simple, yet so delicious and exotic. Last night I decided I wanted figs and cheese, but for dessert. I quickly caramelized some figs with vanilla sugar, then topped them off with a dollop of creamy mascarpone cheese and a drizzle of balsamic syrup (also known as balsamic reduction from my Summer Squash Caprese). You’d think the cheese and balsamic would mike it too strong and not sweet enough for dessert, but you’d be wrong. Very, very wrong. The vanilla sugar and natural sweetness of the figs were just emphasized by the mascarpone, and the balsamic syrup was perfectly tart and sweet. When I popped it in my mouth, I was actually surprised by how much I liked it. Sweet, creamy, fruity and tangy all in one. It was so good that my husband thought the balsamic syrup was chocolate. Silly man. I’ll be making these again soon. And by soon, I mean tonight. Preheat your oven’s broiler. Cut off the top stem of the figs, then quarter them, but only slice about 2/3 of the way down. You want the bottom to remain intact. Sprinkle each fig with 1/2 teaspoon of vanilla sugar and place them on a prepared cookie sheet as you go. When all of your figs are sugared, place them in the middle of your oven for 5 – 7 minutes, or until the sugar bubbles and caramelizes. Watch them closely to make sure they don’t burn. Remove from oven, top each one with a dollop of mascarpone, another sprinkle of sugar and a drizzle of the balsamic syrup. *Add 1/2 cup good, aged balsamic vinegar to a small saucepan and bring to a bubbling simmer over medium-low heat. If your stove is too hot, the balsamic will boil over or burn. Once it starts bubbling, let it simmer for 20 â€“ 30 minutes, or until it coats the back of a spoon and reduces in volume. Set aside and let cool. Keeps in your fridge until it’s gone. I am a figaholic. Everyone knows it. I scream out with delight when I see them at the farmers’ market! This dessert is beautiful and simple. This sounds absolutely incredible! I love figs and once was served brie baked in puff pastry and topped with figs. Delicious! This is the first summer I’ve been enjoying the goodness of figs and I can’t get enough! Thx for the recipe. Thanks everyone. I too am a figaholic – They’re just so goooooooooood! oh my, DROOOOOOL. that is all. I’m with you on the figs–once you get over how weird they look, and their somewhat surprising consistency, you kind of get obsessed. I look forward to August every year so that I can buy fresh ones at my market. This dessert looks fresh, simple, and perfect to welcome in fig season!